One of our aims when we launched Vinous in 2013 was that subscribers would be an integral part of the conversation. Your Say, our subscriber forum, was designed to foster a community brought together by a mutual passion of wine. This holiday season we are delighted to showcase a handful of subscriber posts that stood out over the course of the year. My friend Tom and I have been talking for years that we wanted to drink a Côte Rotie from Marius Gentaz once in our lives. 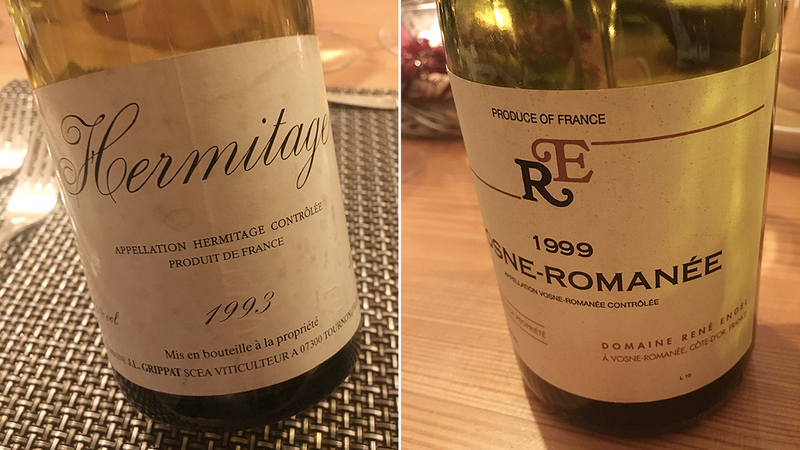 After watching auctions and browsing wine merchant catalogues for a while, we finally found a barely affordable bottle of 1985 Côte Rotie Côte Brune Reservée and decided to share it among our best friends in an evening of wines from wineries that don't exist anymore. We called it the "Evening of Lost Souls". Everyone in our group contributed a few bottles and last night we gathered at Fischerklause am Lütjensee near Hamburg for a wonderful dinner among great friends. We had some real experts in all kinds of wines on the table - Mosel, Champagne, Burgundy, Northern Rhône, so we had a wealth of information available on the history of the wineries whose wines we drank. 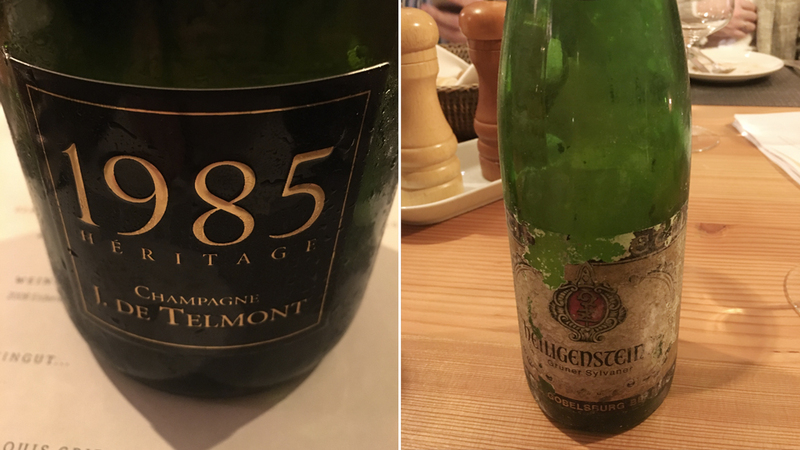 We started with a Champagne from René Collard, a 1985 Champagne Millésime Cuvée Reservée filled and marketed by J. de Telmont, made from 100% Pinot Meunier and disgorged in 2015. My friend Christoph brought it and shared the story about René Collard with us. Apparently, René Collard is the godfather of Pinot Meunier in Champagne and he was recommended to Christoph by Jêrome Prevost. He gave up his winery with lots of un-disgorged Champagne bottles, and it was taken over by J. de Telmont sometime in the late 80s or early 90s. Some Champagnes are gradually released now, but are hard to find. The 1985 was wonderful, it was indeed somewhat close to the Prevost style. Its color was youthful and the bubbles were fine. In the nose, there was some exotic fruit, there were red berries, there was some brioche, it was quite classic. In the mouth, it wasn't bone dry, but quite dry tasting, maybe from the fresh acidity, it was quite rich and dense and expressive, I adored the fine perlage and the long finish. Great start. Then, our host Gerhard Retter, co-owner of the Fischerklause with his wife, treated us blind with a surprise wine, which we guessed to be a Riesling from the 1990s or 2000s. It was very youthful, a bit funky from the sulfur and with some reduction, but opening up with a lot of air – then we had greenish fruit, a somewhat creamy texture, very fresh acidity and some greenish-exotic fruit in the finish. Very linear, lean and fresh. It turned out to be a 1981 Zöbinger Heiligenstein Grüner Sylvaner from Stift Zwettl (which is now Schloss Gobelsburg). What a surprise. It also paired well with our amuse, a finer version of Labskaus, a Northern German dish made from salted beef with potatoes, onions, red beetroot and served with salted fish, a quail egg and pickled cucumber. 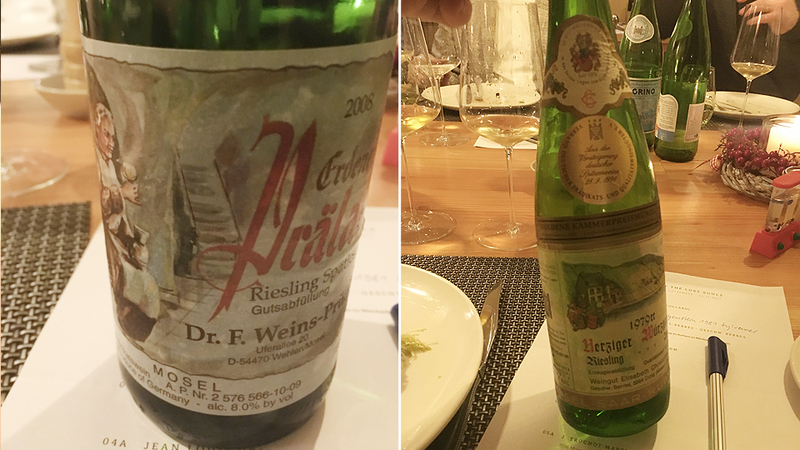 Next up was a pair of off-dry Rieslings: Elisabeth Christoffel-Berres (Geschwister Berres) - 1979 Ürziger Würzgarten Riesling Auslese *** Auction and Dr. F. Weins-Prüm - 2008 Erdener Prälat Riesling Spätlese. Christoffel-Berres used to be the No. 1 in Ürzig once upon a time. Some time in the late 1970s or early 1980s, the winery gave up and the vineyards were taken over by several other growers, such as Dr. Loosen and Karl Erbes. The wines are legendary though. This 1979 Auslese was auctioned off at the Wiesbaden Auction in 1981 where many top growers from the Mosel, Nahe, Rheinhessen and Pfalz auctioned off their wines back in the days. The Dr. F. Weins-Prüm winery was bought by Joh. Jos. Prüm in 2009 except for their Erdener Prälat holding, which was sold to Dr. Loosen. The two Rieslings were served to accompany a non-stuffed goose liver mousse with orange gelée and salad. The Christoffel-Berres was absolutely magical and great with the goose liver. It had notes of orange jam, honey, and exotic fruit, laser-like acidity and very clean botrytis. It was medium sweet and very lively. The Weins-Prüm was still very young, still showing notes of spontaneous fermentation and primary fruit. It will likely be a great, fairly light Prälat in ten years-time, but the Christoffel-Berres stole the show. After two corked old Wachau Rieslings from 1985 and 1986 we moved on to a pair of dry whites, served with excellent Quenelles de Brochet with a Beurre Blanc and spinach, made from fish from the lake by which we were sitting. The wines were too different to drink simultaneously, so we drank one after the other. Jean-Louis Grippat stopped making wine in 1997 and sold his small holdings to the Guigal family. His 1993 Hermitage Blanc was outstanding and one of my wines of the night. It was fairly light for a white Hermitage, it showed notes of coffee, roasted nuts, nougat, white flowers, wax and spices, it was fluid in the mouth, not too rich, even with fairly fresh acidity and a very spicy and long finish. It was great with the Quenelles de Brochet, but the even better match was the 2010 Arbois Savagnin from Jacques Puffeney who is still selling off his Vin Jaunes that he still has in barrel (the last vintage will be 2014) and kept a tiny holding of Trousseau, but sold the rest of his vineyards to the d'Angerville family from Volnay. The 2010 Savagnin needed a lot of time to get balanced, but was wonderful then with its elegant oxidative notes, its notes of yellow curry, green walnut and preserved lemon, its bracing acidity and its energy in the mouth. Great wines for a great dish. Moving on to the red wines, we started with a couple of red Burgundies. 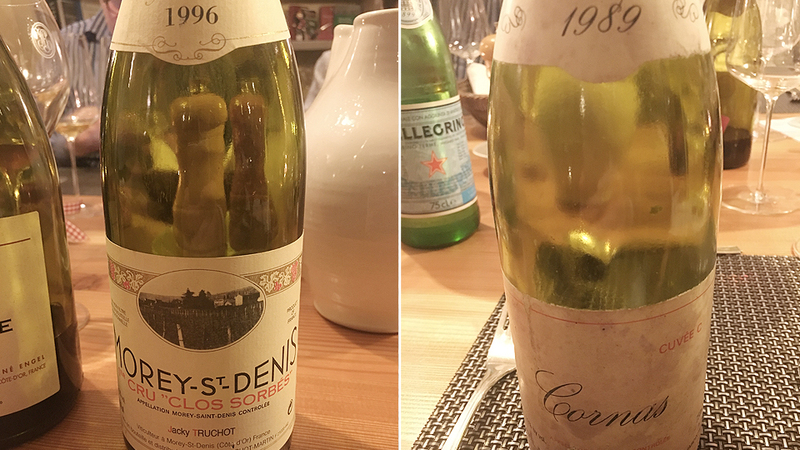 The 1996 Morey St. Denis 1er Cru Clos Sorbé Vieilles Vignes from Jacky Truchot (vineyards now owned by Francois Feuillet and David Duband) was very funky and reductive at first, but woke up quickly and then displayed slight animal notes as well as fresh red fruit, light red flowers, quite some power behind the subtlety and silkiness in the mouth. The complete opposite to this wine was the 1999 Vosne-Romanée Village from René Engel (vineyards now owned by Domaine d'Eugenie). It was a lot fuller, richer, more structured, denser, darker in its fruit profile with notes of cooked plums with cinnamon. Two really different wines, both with their special appeal. If you wanted to show someone the difference between Morey St. Denis and Vosne Romanée, these two would be good examples. Our dish for the two wines was duck Bratwurst with mixed lentils. Already upon opening, we had to fear that the supposed highlight of our evening, a bottle of 1985 Côte Rotie Côte Brune Cuvée Reservée from Marius Gentas-Dervieux would suffer from TCA. You never know, we didn't give our hopes up. But TCA gets worse with air and by this time and after some time in the decanter, it was clear: this wine was corked. D… it. We quickly moved on to the next pair of wines to forget about the Gentas: two Cornas. The Marcel Juge - 1989 Cornas Cuvée C was wonderful, very mellow and easy going for a Cornas, hints of black pepper and game, but mostly just silky red and black fruit, very fine-grained tannins and great balance. A Cornas for lovers of Burgundy (quite a few on our table are more Northern Rhône fans and found the wine too smooth). The Northern Rhône fans were happier with the Robert Michel - 2001 Cornas La Geynale with its notes of raw meat, iron, tapenade and violets. I found it too young, the tannins were a little furry, but the energy and vivacity of this wine were admirable. It went really well with our dish of wild boar with carrots shot by the grandpa of our host. The tannins felt softer and while the Juge was maybe not powerful enough for the wild boar, the Robert Michel was. To include a Marcel Juge wine into this tasting was cheating a bit as he still makes wine. I don't know where the majority of his vines went. But I do know that the Robert Michel vineyards are now part of the Vincent Paris holdings in Cornas. An intermediate bracket of red Bordeaux showed two very different styles. The 1995 Château Magdelaine St. Émilion Grand Cru Classé B (now part of Château Belair-Monange) was one of the only really disappointing wines of the evening. Stewed fruit, the alcohol was showing a bit, it was jammy, quite sweet (though dry) and just not very uplifting. Quite the opposite was the 1983 Château La Tour Haut Brion Pessac-Léognan (now part of Château La Mission Haut Brion), which was green as hell, but in a good way. A lot on the table said that it must be a 100% Cabernet Franc, which it wasn't, but it did have some 30% of Cabernet Franc in the cuvée. There was green pepper, green bell pepper and some black fruit, but the tannins were not green or hard. It was lean, fresh, strict and very classic. Next to the St. Émilion, we liked this light-year better. A mix of the two would probably be the best, but in its old-school style the La Tour Haut Brion was quite interesting as it was. Time for some sweet wines. First, we had a semi-sweet wine, a 1994 Jurancon from Clos Joliette. The owner Michel Renaud passed away in 2015 and his tiny holdings of just over one hectare is now farmed by Jean-Marc Grussaute from Camin Larredya until someone is found to continue Clos Joliette. A Clos Joliette was very high up my bucket list of wines I wanted to drink once in my life and now I did. I wasn't disappointed, but this wine wasn't easy to drink and needed a lot of attention. It had a lot of alcohol (14.9% Vol. ), it wasn't very sweet, really a bit half-dry, and the acidity was so strong, my face got red with each sip. There was A LOT of power in this wine, sort of a sledgehammer kind of wine, super wild, untamed, not elegant at all, but very expressive. I don't know what to make of it, but it was a great experience to drink this wine. 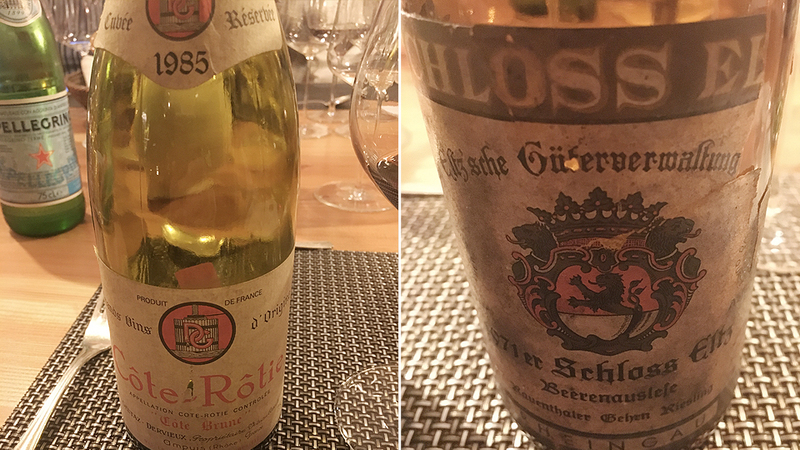 Then we had a bottle of 1971 Schloss Eltz - Rauenthaler Gehrn Riesling Beerenauslese and (later on) the same wine as an Auslese. The BA was a stunner and my wine of the night next to the Hermitage. Caramel, orange peel, baking spices and red apple in the nose and a truly great balance in the mouth with shining acidity and lush sweetness, super complex, divine sort of. The Auslese had more of the Rheingau medicinal bitter notes and didn't seem quite correct. Schloss Eltz had its last vintage in 1976, but continued to produce wines until 1979 under different ownership. Then most of the vines were taken out and a road was built on the land. Only some vines in Eltville survived, which are now farmed and bottled by Langwerth von Simmern. To end the night we had a bottle of Artur Barros e Sousa (ABSL) - NV Bual Reserva Velha. I bought this in Funchal this summer for a friend and he was so generous to contribute the bottle to our tasting. It had been bottled in 1997 and should come from 20 to 30 year old wines with maybe some older reserve wines in the cuvée as well. ABSL is now part of d'Oliveiras and there will be library releases in the future under the ABSL label, but the firm has disappeared and d'Oliveiras has taken over their farming contracts and winemaking equipment. This was a worthy last (official) wine and didn't need any dessert as it was a dessert on its own. Very subtle oxidation, almonds, dried dates and figs, super fresh acidity and a very restrained style were the hallmarks of this beauty. After this wine, we continued to sit together for a few hours, had a few younger lighter wines (among others a really nice 2015 Kanzemer Altenberg Riesling Kabinett Auction from von Othegraven) and talked and laughed. This was a super relaxed evening with a lot of great stories about the historic estates, from which we drank the wines. We will probably never do this again at this level. But I will always keep this great evening in my memory.